Detroit, Michigan – Cadillac established the V performance line back in 2004 as a domestic alternative to European luxury performance sedans from the likes of Audi, BMW and Mercedes-Benz. The ATS-V, with an innovative, all-new 464-horsepower, twin-turbo V6 under the hood, arrived in 2016 (debuting in LA), three years into the life of the 3 Series-rivaling ATS small sedan. For the 2017 model year, the ATS-V receives a connectivity upgrade in the form of a standard CUE infotainment system and a Carbon Black package that brings together several existing exterior and interior options and packages for a better-value US$7,800. We spent a few days with the latest model in Michigan and Ohio to see how it measures up on road and track. Cadillac’s Art & Science design language has long been one of the most distinctive around. The right-angle excesses of the early cars have been reined in and to this reviewer the ATS-V’s styling is a nice blend of stealth, muscle and Cadillac edginess. If the 2016 Escala concept is an indication of future direction, then upcoming models will be more rounded still. Our test car came in Black Raven paint and was fitted with the US$5,000 Carbon Fiber package, which adds a carbon-fiber bodykit. On the US$900-option, 18-inch polished-face alloy wheels, the overall look is about as close to Darth Vader as you’ll get in a road car. We liked it a lot. Less appealing is the familiar and slightly clunky Cadillac touch-sensitive switchgear (although the 8-inch touchscreen works well) and a general feeling that space is a little tight. As a driver I found the environment a little snug and it wasn’t straightforward to find a comfortable seating position in the Recaro bucket seat (a US$2,300 option); the situation may be exacerbated for occupants taller or wider than myself. There was plenty of driver-assistance tech fitted to this ATS-V, but much of it only as part of the US$1,850 Safety and Security package, which itself requires fitment of the US$2,500 Luxury Package. The vibrating seat warning for the rear cross-traffic alert and forward emergency braking works well and the gentle steering correction extension to the lane-keeping assist is helpful in highway driving. I could write an entire article about the 3.6-liter, twin-turbo V6 at the heart of the ATS-V. It’s a standout feature and a tech-fest for powertrain nerds everywhere, with an emphasis on reducing the lag that can compromise a lower-capacity, turbocharged engine. Weight-reducing titanium is used in the turbines for the two MHI turbochargers, as well as for the con-rods as a means to further lower the inertia of the moving parts. That’s complemented by a patent-pending charge cooling system that reduces airflow routing volume by 60% as another contributor to rapid throttle response. 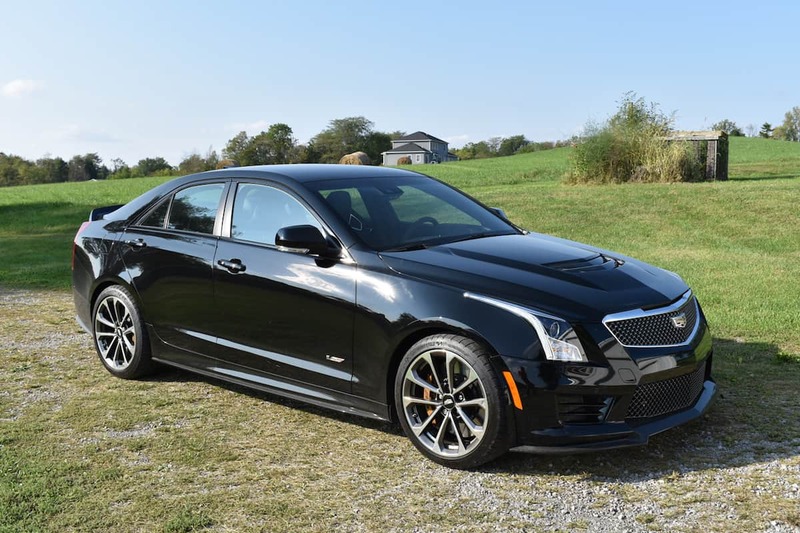 The ATS-V, with an innovative, all-new 464-horsepower, twin-turbo V6 under the hood, arrived in 2016, three years into the life of the 3 Series-rivaling ATS small sedan. Happily, it all adds up to a cracker of a powerplant. Bury the throttle and the ATS-V is fired forward as quickly as you’ll ever need (official 0-60mph time is 3.8 seconds) in concert with a suitably muscular soundtrack. Some 445 lb-ft of torque make overtaking easy and your main concern quickly becomes staying within posted speed limits. Perhaps best of all, that performance doesn’t come at the expense of sensible cruising manners – quite the opposite, in fact. In a long highway cruise south from Detroit to central-Ohio, the ATS-V returned a remarkable 29mpg and was a model of docility – and all without the cylinder deactivation tech that’s standard on lesser Caddy V6s. After picking up the ATS-V I first spent some time on Detroit’s notoriously broken-up freeways. Any car that acquits itself passably on the unforgiving concrete surfaces is worthy of a closer look and the Cadillac, despite its performance credentials, did a surprisingly good job of limiting the damage. That’s thanks in no small part to the Magnetic Ride Control adaptive damping, which enables it to offer a supple ride when cruising without sacrificing the handling performance you want on a winding road or racetrack. It was interesting to see how the Cadillac’s rear was commendably more resistant to power-oversteer at corner exit than I’d perhaps expected, given that in road use it displayed a tendency to wag its tail, quickly gathered up by the electronics, when accelerating rapidly out of a tight intersection. As you cross the state line into Ohio the roads improve noticeably, enabling the ATS-V to showcase minimal tire roar from the Michelin Pilot Super Sport summer tires and a hushed cruise performance that must be up there with the segment’s best. It feels rock steady, too. The precise steering isn’t sloppy around the straight ahead and is weighted nicely, but in common with most modern electrically assisted systems, there’s less feel than you’d like. Also lacking a little in terms of feel are the brakes, but there’s no doubting the arresting power of the huge Brembo setup (in this case with optional, US$595 dark gold calipers), as was demonstrated in some repeated sharp stops on the handling track at the Transportation Research Center (TRC). TRC was generous to offer us some track time in the company of Roger Schroer, a hugely experienced instructor and vehicle evaluator, who can also boast the title of world’s fastest electric vehicle driver – 341.4mph (549.4km/h) in Venturi Buckeye Bullet 3 at Bonneville in 2016! The ATS-V offers as much speed, response and agility as most of us will ever need from a road-legal track car and we were quickly comfortable accessing the performance in Track mode, while taking care not to destroy the Michelins. It was interesting to see how the Cadillac’s rear was commendably more resistant to power-oversteer at corner exit than I’d perhaps expected, given that in road use it displayed a tendency to wag its tail, quickly gathered up by the electronics, when accelerating rapidly out of a tight intersection. Note that our test car came with the US$2,000-option, eight-speed GM automatic gearbox with magnesium paddle shifters. It would have been interesting to also try the ATS-V with the standard Tremec TR6060 six-speed manual, which comes with track-friendly technologies such as automatic throttle-blipping, flat-shifting and launch control. By the time the various options and packages had been fitted to our ATS-V, the US$60,695 base price had climbed to US$77,740, plus destination charge. It’s a little disappointing that more of this stuff isn’t standard on a top-of-the-line model – cosmetic enhancements to personalize your vehicle are one thing, but features such as adaptive headlamps, a split-folding rear seat and a remote locking fuel-filler door really ought to be standard on any luxury car. Cadillac itself bills the ATS-V as “a dual-purpose luxury performer” – equally capable on the track and sophisticated on the road. That’s not an unreasonable assessment, based on the time we spent with the car. Much like the Alfa Romeo Giulia Quadrifoglio I drove earlier in the year, the ATS-V offers something distinctive and different in a class traditionally dominated by the German Big Three luxury brands. That in itself is no reason to buy unless the car itself can compete with some stiff opposition; happily, the ATS-V ticks enough important boxes – notably its epic engine, everyday usability, user-friendly track manners and attractive design – to merit serious consideration.